The Islamic State of Iraq and Syria (ISIS) conquered Mosul, Iraq’s second largest city and demanded a poll tax from Christians. When an Assyrian family said they did not have the money, three ISIS men raped the mother and daughter in front of the husband and father. He was so traumatized that he committed suicide. Four Christian women were shot and killed by ISIS members because they were not wearing veils. Two Sundays ago, for the first time in 1,600 years, church bells have fallen silent in Mosul and no Mass was celebrated. Christians are fleeing in terror. “Since the fall of Mosul, a litany of evils has replaced the liturgies of the Christians there: a young boy ripped from the arms of his parents as they ran from the ISIS advance and shot before their eyes, girls killed for not wearing the hijab,” wrote Andrew Doran and Drew Boling for The Daily Beast. In late 2013, ISIS wrote Steven a letter threatening to behead him unless he left the city. He resisted initially, unwilling to let extremists uproot his life. But ISIS shot at him several times, persuading him and his wife, Babyl, then newly pregnant, to flee to Jordan. However, they returned after a few months when she became ill and he was unable to find work in Jordan. A few days later ISIS conquered Mosul and the Christian couple fled their home a second time, with Babyl 8 months pregnant. They fear for their unborn child who will be born into a family with no belongings, no money and little food. “I just want to get out of this hell,” he wrote in an email. 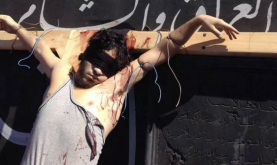 ISIS told Christians in the province of Raqqa, “Convert to Islam, die - or sign a treaty of submission,” which forbids them from practicing their faith openly. By imposing this treaty, ISIS is following an orthodox Sharia practice, which compel Christians in Islamic society to live in a subservient state of dhimmitude. Egypt: USA Today reported last August that in Egypt 40 churches were looted and burned down in one week and 23 others were attacked and severely damaged. For example, 1,600 years of prayers ended at three Egyptian churches which are part of the Virgin Mary and Priest Ibram Monastery. And 200 businesses owned by Christians were torched. North Korea has imprisoned 30,000 Christians – making it the world’s most oppressive nation. Nigeria: On June 29 scores of Christians were killed and five churches burned to the ground near Chibok where nearly 300 Christian school girls were kidnapped by Boko Haram in April. As people gathered for a Sunday service, Boko Haram terrorists fired at worshippers and those who tried to escape were chased and gunned down – 50 worshippers. Their homes were torched. There was one silver lining, however. While Boko Haram (which means Western education is sin) was attacking the village, 63 of the girls they kidnapped – escaped and reached home. However, 300 Nigerian churches were destroyed in 2013, and 2,000-2,500 were killed. This year another 3,000 more were murdered. According to Open Doors, a Christian ministry helping the persecuted, militants gather people together, appearing to offer protection – before spraying them with bullets. Open Doors has helped rebuild some of the Nigerian churches, distributed Bibles and given micro loans to help individuals create businesses. Open Doors has a World Watch List of the 60 countries with the harshest Christian persecution starting with North Korea, Somalia, Syria, Afghanistan, Saudi Arabia, Pakistan, Iran and Iraq where a million Christians used to live – but now only 300,000 – all of whom are in Kurdistan, where they are protected. To learn more, see the World Watch List, or to contribute, go to OpenDoorsUSA.org.